A while back we did a review of an excellent Zeiss Diavari V 6-24x56mm rifle scope which ended up being an excellent scope. But there is a Military division of Zeiss that deals with primarily tactical and sniper scopes for Military use. The name of this division of Zeiss is Hensoldt. Because their market is the Military and Law Enforcement units around there world, there are no real resale outlets for the average non military person to pick up a Hensoldt, that is what Zeiss Optics is for, but you can get them with some effort, even if you are not on a procurement team for an elite military agency. 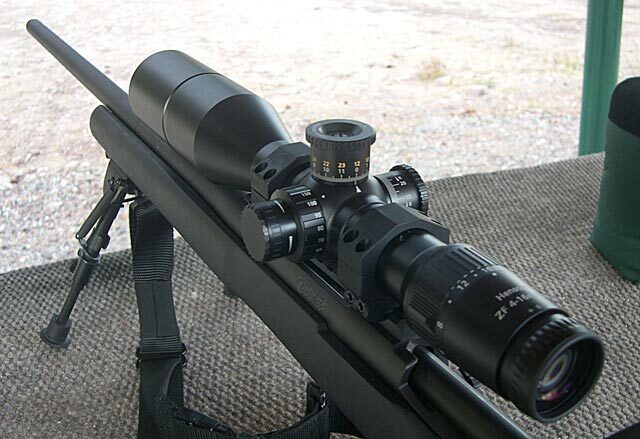 A loyal Sniper Central reader provided us with a Hensoldt 4-16x56 FF scope he sourced direct from Hensoldt in Germany. First I will make mention that Hensoldt scopes are generally marketed to the European militaries and as such everything is in metric units and the price was only listed in Euro’s, though there are English versions of the manuals which was helpful. The Next thing to mention is that this scope shares many things with its civilian Zeiss counterpart scopes, as you would expect. Even the plastic lens caps have the Zeiss name and logo on them. 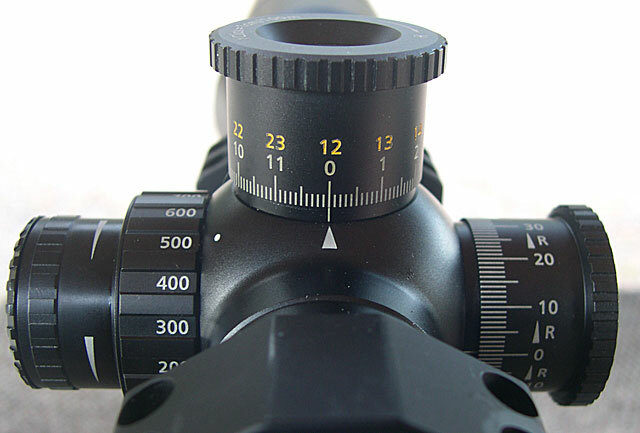 The scope has the same superb quality feeling to it including the matte black exterior finish. The scope is fairly compact in relation to some of the other scopes out there, but it is heavy. Why is that? Well, if you are making a scope for military use, it might as well be a steel tube with 34mm diameter. The construction material and the diameter of the tube allow for an extremely rugged and durable scope, though it does weigh 2 lbs. Normally in my eyes a scope with a 1″ tube and a 56mm objective looks nose heavy or out of proportion, and even with a 30mm tube it has that same look, though not quite as pronounced. But with a 34mm tube, this scope looks just about right and it is not until you get it on your rifle with the large rings that you really notice the size of the tube in relation to the rifle, but it is a good looking scope (Not that that matters!). The 34mm tube does allow for a stronger tube as well as some additional elevation adjustments, it is not for aesthetics. The knobs on the scope are fairly large with knurled ends to aide in gripping the knobs. The force to move each click is fairly high but with nice positive clicks with an audible click that is just about right. On external adjustment knobs with no dust caps, the high force to move them is desirable to help prevent accidental movement of the knobs during normal patrol/combat operations. The Elevation and Windage knobs have 120 clicks (120cm, or 41.23 MOA) per revolution which is quite high. Enough to get a 308 Win from 100 to 1000 meters in a single revolution. The trick is getting enough up after zero to allow this. The Hensoldt manual mentions that to get enough up elevation for long range shooting it requires a canted base. The total elevation is listed at 112cm from the mechanical zero (half way up), we had a total of 228cm, or 124cm from mechanical zero on this particular sample. With a 20 MOA tapered base, after we zeroed the rifle at 100 meters, we had 162cm (55 MOA) of up elevation left giving us enough to get well beyond 1000 meters from a 100 meter zero and a .308 cartridge. The windage (Hensoldt calls it azimuth, which is probably more correct) knob counts up in both directions and has the same high force positive clicks as the elevation knob and clear indications all the away around the knob as to which direction is “right”. The actual knob design is slightly different than the Zeiss Diavari we tested, but the side parallax adjustment (focus) knob is the same. It takes less force to move than the adjustment knobs and is very smooth through out the range and has nicely spaced intervals from 50 to 1000 and then infinity. The one thing you will notice is an additional knob on the left of the focus knob, this is the rheostat knob for the illuminated reticle and is of unique design and function. It has a “forever” adjustment meaning it will just spin and spin and spin, never getting to an end in the adjustment. The actual full adjustment of the brightness happens in about 270 degrees of a turn (3/4 of a rotation). The illumination lights up the center mil portion of the reticle as well as the quick ranging steps and it is excellent in function and design. There is no leaked light and the reticle remains very crisp and defined. I did inadvertently grab the brightness adjust knob once thinking I was adjusting the side focus. Having both controls in a stacked design like that could lead to that, but with training and familiarity this will not be an issue, especially with the different sizes and feel of the two adjustment knobs. The knobs are in Metric units with each click measuring 1cm at 100 meters, but of more importance is that this also equates to each click being .1 milliradians putting the adjustments in the same units as the reticle. The 34mm tube is one of the newer large design tubes (35mm being the other size growing in popularity) and it certainly is durable or very ‘military grade’. The only limitation being the difficulty finding rings, the ones we user are made by Seekins, and the extra heft of the scope. I think those are reasonable things to live with if you view the benefits of the extra adjustments travel and durability are worth it. The 30mm scope tubes are plenty adequate and I’m not really sure just how much more durability and adjustments, or other advantages, of a 34mm or 35mm tube are really necessary or just the bigger is better mentality. This scope does have about 80 MOA of travel, but that is really not better than other quality 30mm scopes in that same magnification range. I suppose what really matters is that this scope, with its large 34mm tube, is of excellent quality and durability with a good amount of adjustments. 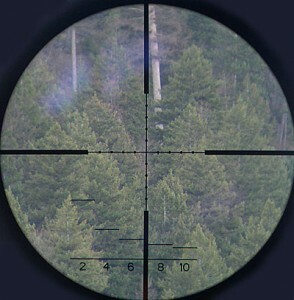 The reticle is a traditional mildot reticle with what appears to be the US Army standard .22 milliradian diameter dots. 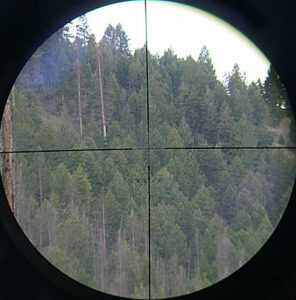 The unique thing about this reticle is the rapid ranging steps in the lower half of the scope. The idea is similar to the human ranging scale you will see in some PSO and other scopes with the idea at least becoming popular on the SVD rifles, if not originating there. The difference here is that these steps are used to quickly measure a one meter tall target. You simply find the step that correctly covers one meter on, or near, the target and then read the number beneath and add two zeros. The 2 means 200 meters, 4 means 400 meters, etc. The use of a meter is a good choice provided you can rightly estimate a 1 meter size target. Nothing a little training can’t resolve. The reticle is in the first focal plane (FFP) which makes the reticle grow and shrink depending on the magnification so that the measurements on the reticle are always correct. The picture above illustrates the size of the reticle at 4x which you can compare to the picture of the reticle at the top of the page which was done at 16x. The thickness of the stadia is always a challenge to get right on FFP scopes so that it is visible at lower powers but not too thick at high magnification. Hensoldt did a good job with this one and I have no complaints. Yes, the entire reticle is fairly small when at 4x but it is still usable, contrary to what the photo above may look like. We lose the clarity and sharpness when getting that digital image of the reticle to your computer screen. The optics on the scope are fantastic. They are extremely bright, clear and are very sharp. Zeiss has the reputation for exceptional optics and that reputation is well deserved. As you would imagine, they do not cut any corners for their military brand Hensoldt scopes. The light gathering from the 56mm objective is impressive and I could not find fault in the optics, they are fantastic. The eye piece has a fast focus style dioptre adjustment that moves about 1.25 rotations. It adjusts from a range of -2.5 to +2 which will cover most bad eyes out there. There are some light knurls on that eye piece adjustment to help with gripping it for adjustments. The power adjustment ring also is knurled with a single larger raised finger indent to aide in gripping it and it takes moderate force to adjust the power but it is very smooth through the full range. 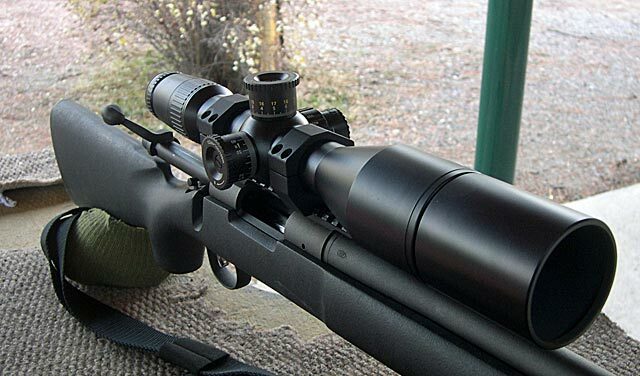 We mounted the scope on our Remington 700P test mule rifle and headed to the range for the shooting evaluations. The eye relief on the scope is just about right and should work fine on magnum rifles. All of the adjustments and controls are military durable and very usable and easily read from just about anywhere behind the scope. The weather was overcast and 27 degress with calm winds and we zeroed the rifle and zeroed the knobs. The knobs are a tooth design meaning the knob has teeth that match to the internal mechanisms teeth. This insures positive connection at all times but it also means that the markings can be slightly off from the reference mark on the scope body. This particular example was right on, another sign of quality. With the knobs zeroed we ran the scope through “the box” shooting groups at each corner of a box by adjusting the knobs and then shooting a final group back where we started to insure repeatable adjustments. This scope was dead on all the way around. We like to shoot some cross corner boxes as well to test the adjustments while moving both of the knobs between groups and the results were the same. The summary of this scope pretty much says “excellent” in every important category. An argument can be made that the larger tube adds a lot of heft for not much advantage over a 30mm tube, but the argument can also be made the durability and extra adjustments are worth it. We will not try to settle that argument but we will comment on the merits of the scope which were all positive. If we were assembling a tactical rifle package this would certainly be one of the scopes on the short list if price was not an issue. They are expensive, but you pay for quality as well. The only negative in the log book was the mistaken use of the reticle brightness knob as the focus knob, but that was it and that issue will easily be resolved with a bit more familiarity. With everything taken into account, I highly recommend this scope for tactical use. Well, I’m going to start saving my pennies! I was leaning toward a Zeiss anyway, and this just has everything that’s great about a Zeiss, only more so. I especially like the reticle shown in the review – looks very useful, especially for a FFP location. Short of friends in the European militaries, are there any real sources for a buyer in the US? We can get the Hensoldt scopes. We have some of them in stock here and can get any of the others.